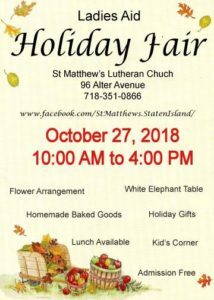 About Us | Welcome to St. Matthew’s Lutheran Church on Staten Island, New York. …Telling What He Has Done! Known in the community as “the little church with the wide open doors.” St. Matthew’s welcomes and invites you to enter our church family fellowship as we worship together our wonderful Lord and Saviour, Christ Jesus. St. Matthew’s Lutheran Church has been meeting the spiritual needs of people in the community since 1915. It was founded by German residents who began to settle in the area. We are located just one block over from P.S.11 on the corner of Jefferson Street and Alter Avenue in Dongan Hills. Family Worships is at 10:00 A.M. each Sunday throughout the calendar year. Solid, Bible-based sermons are preached at every service. Hymns of praise and thanksgiving are also an essential part of each Sunday’s service. Holy Communion is offered every Sunday and during special holiday services, and Baptisms are performed when needed. By way of less formal fellowship, our Church picnic is held on the church grounds in September for all to attend. Our Ladies’ Aid Society sponsors a Strawberry Festival each Spring and a Holiday Fair each Fall. As part of the pastoral cared offered by our pastor, the Reverend Philip Saywrayne, our sick and shut-ins are visited regularly. Pastor conducts classes for our young communicants and adults interested in membership. Pastor counsels couples about to be married as well as with families or individuals who request such help. We invite you to visit with us, and make use of any of the programs or services outlined above. If you would like further information, please call the church at 718-351-0866. Remember, the God who created this universe is the good God. He has given the good and the evil alike all good gifts. He is worthy of the praise and thanksgiving of all people and desires peace, safety and salvation for all of His creatures.